Firefighters have said "inconsiderately parked" cars "put lives at risk" after crews were delayed getting to a house fire where a man needed rescuing. 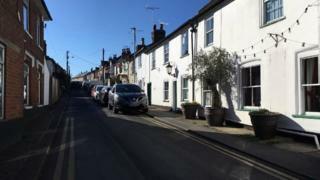 The cars had parked on double yellow lines at a junction, preventing crews from reaching a call-out on Albion Street in Rowhedge, Essex on Saturday. Crews were delayed by 10 minutes and when they arrived the man had been rescued by his partner and a neighbour. The man, in his 50s, required hospital treatment for severe smoke inhalation. Colchester fire station watch manager Darren Holliday said: "It is incredibly frustrating when inconsiderately parked cars not only prevent us from doing our job, but quite frankly put lives at risk as they did in this case. "Please, when parking your car, think: could a fire engine get through easily? If the answer is no, please don't run the risk." A couple who live on the High Street said people parked on the double yellow lines there "all the time" and they were "sick of policing it". "The reason it's double yellow is because the emergency services have to get in and out. There's not an excuse for it," said another resident, who did not want to be named, adding some signage might help. Essex Fire and Rescue Service said the blaze, that happened at about 21:30 GMT, started accidentally after a kitchen roll was placed too close to a hob and caught fire.